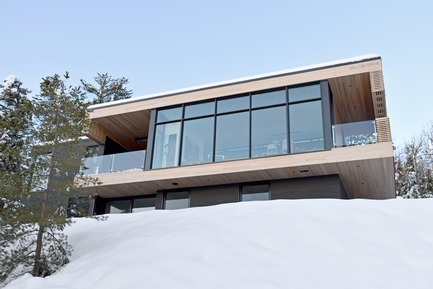 This second home is perched on high ground in Charlevoix, a place made famous by the classic novel Menaud, maitre-draveur. 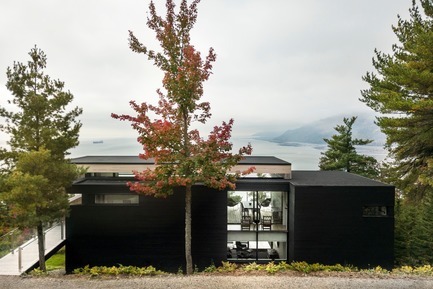 The house is located on a shared private drive; accordingly, the more opaque secondary volumes by the roadside are oriented to protect the privacy of the living spaces, which face breathtaking views of the majestic landscape. 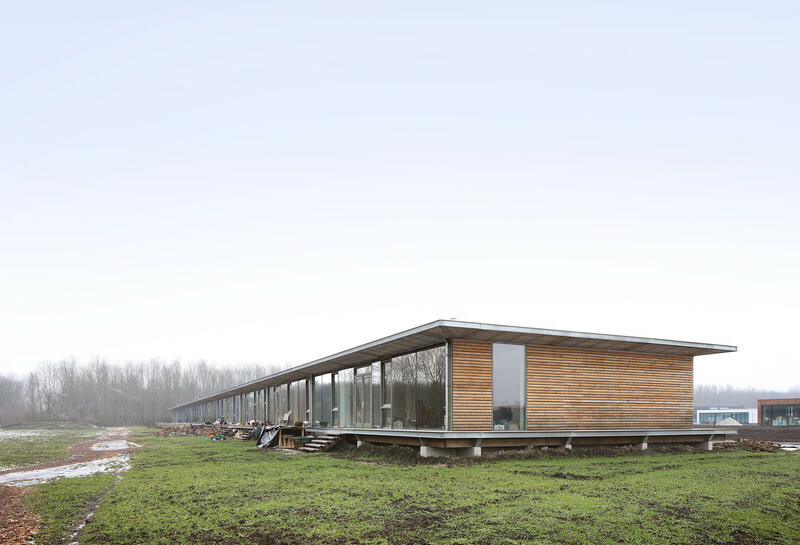 On entering the site, the building is barely noticeable: all mature vegetation was preserved, and the colour of the wooden exterior blends into the colour of the bark on the nearby trees. 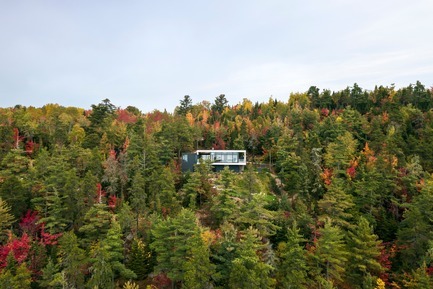 The house sits delicately on a narrow escarpment located below the access road, creating the illusion of inaccessibility, like a bird’s nest in a tree. 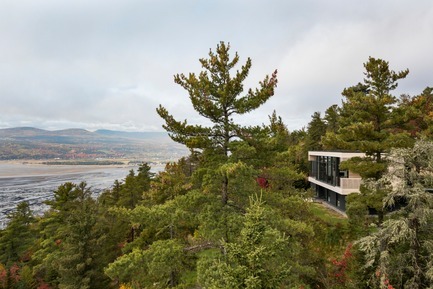 A large opening in the building reveals a superb view of the Massif de la Petite-Rivière-St-François through the glass railing of the walkway leading to the master bedroom and covered porch. 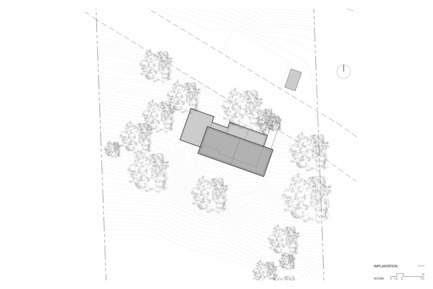 This is the first contact the house enables with its bucolic surroundings. 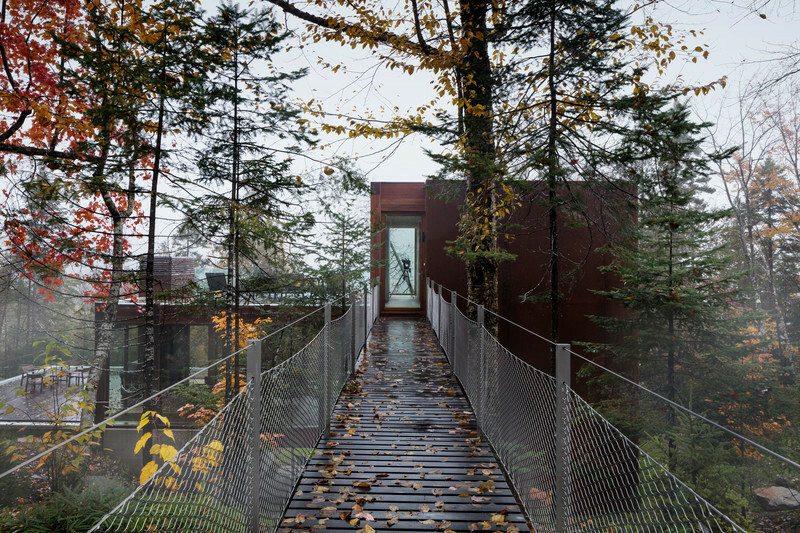 A bridge attached to the house invites us to enter the landscape under a canopy of hundred-year-old pines. 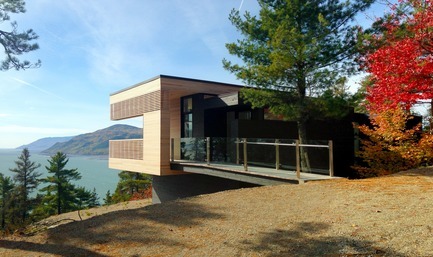 This walkway, made of cedar, crosses the main volume toward a spectacular lookout. 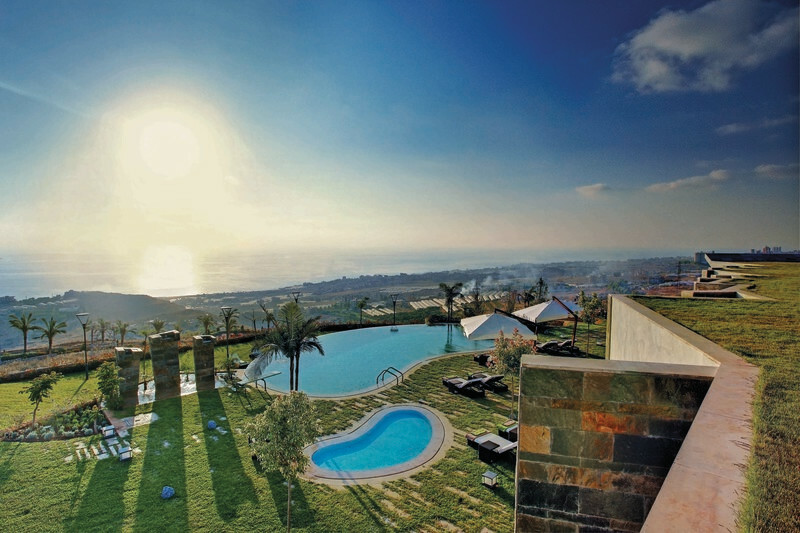 Before they even reach the main entrance, visitors are irresistibly drawn to the panoramic view. The positive impact of architecture is evident here, as it shapes guests’ path and allows the owners to see who has arrived. The main entrance, on the northeast side, leads into the secondary volumes. Main traffic areas, utilities and storage are found in this part of the house. Upon entering the foyer, visitors have direct access to the main living area, an abstract volume that seems to float above the lower level and adjoining spaces. 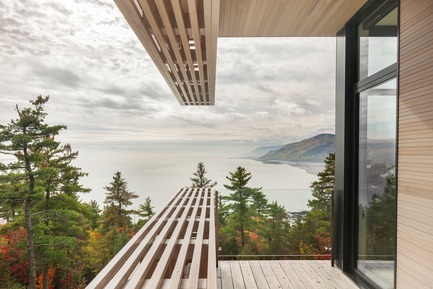 The living space’s glass wall provides a picturesque frame for the river, the Massif de la Petite-Rivière-St-François and Baie-Saint-Paul. 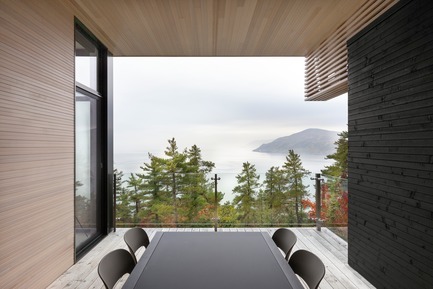 Resembling a triptych painting, the lateral bay windows complement the composition of the main view, allowing glimpses of the tip of Ile- aux-Coudres to the southeast, and of the countryside northwest of the town of Baie-Saint-Paul. 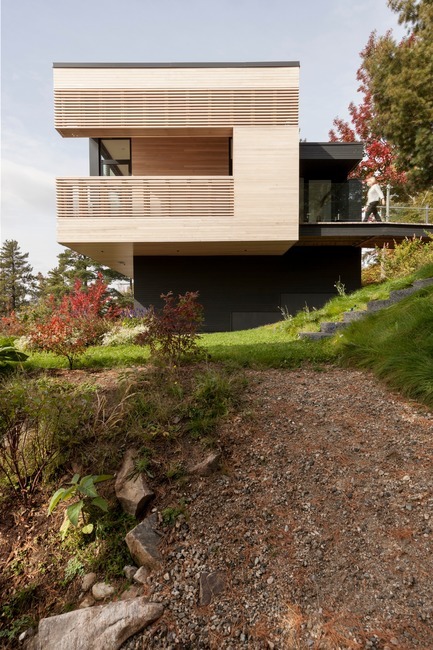 This volume, finished in pale cedar – including the covered porch – boasts large windows around its entire perimeter, for controlled but constant natural light throughout the day, in every season. 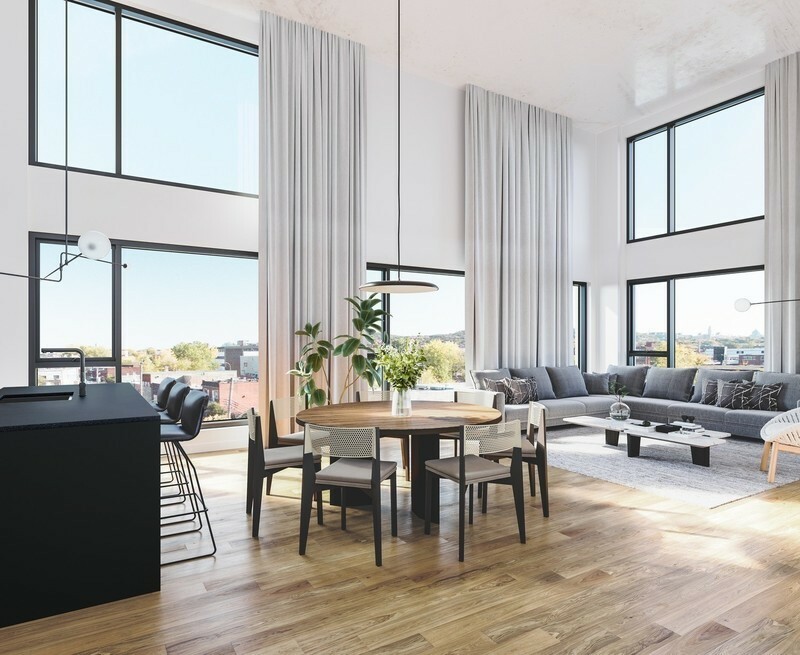 To the west of the living area, the master bedroom is accessed via the glassed-in walkway, which protects the privacy of the bedroom while admitting plenty of natural light into the heart of the home. The sunny spaces on the garden level include guest rooms, a secondary living area and access to a deck overlooking the estuary and Baie-Saint-Paul. 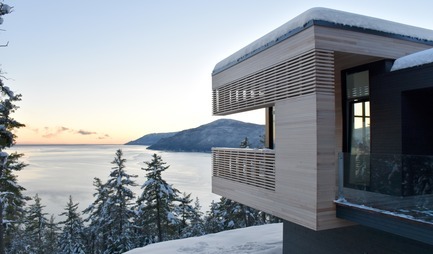 The house, which has 240m2 of living space, is perched on a mountainside. The soil is unstable, and the area is seismically active. Wood is used in several forms. 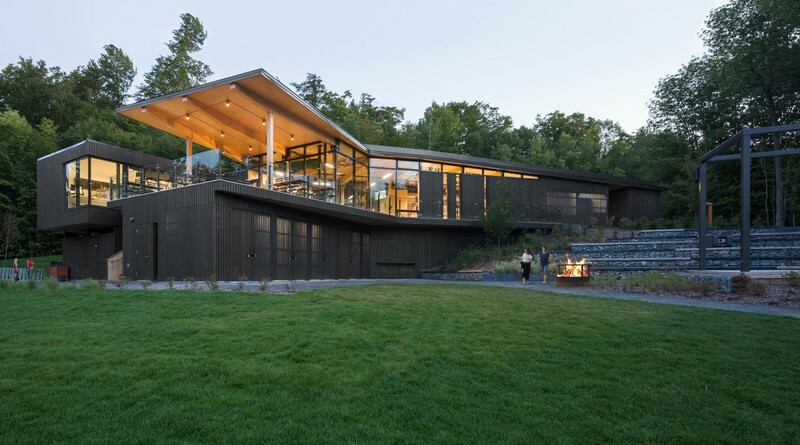 A balloon-frame and crossbeam volume, with dark, horizontally installed spruce siding – harmonizing with the site’s stratification – supports the Nest, a pale-cedar volume suspended above the site. 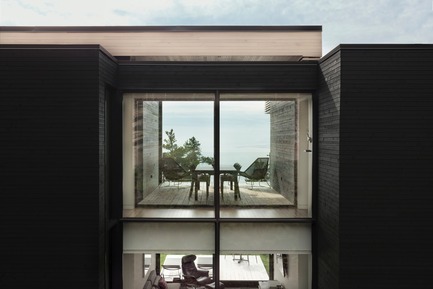 The siding alternates between full and gapped coverage, making it functional both as a railing and a screen. Fully open on four sides, with no visible vertical support, the Nest’s roof seems to hang above the volume it covers. The interior and exterior spaces are juxtaposed and superimposed, leaving no hints as to the technical challenges posed by the double cantilevers and heated sections. Special attention was given to fine construction details and to overall construction quality. The result is the perfect integration of insulation, structural elements and mechanical-electrical systems with the architectural components of the floors and roofs. 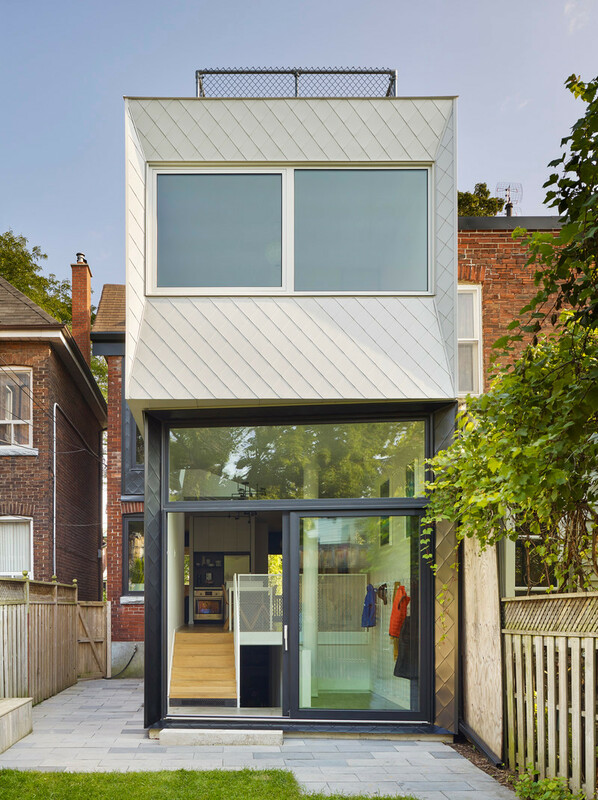 The winner of the prestigious Governor General’s Award for architecture in 2016, the Anne Carrier architectural firm is recognized for the quality of its work and its excellent service, as well as for its ability to solve complex problems with a simple, effective and sustainable approach. The firm has earned more than 35 awards and distinctions during its 25-year history, in recognition of its mastery of building design and technology, as well as its ability to work within budgets and to exceed client expectations. Since 1992, the firm has been strongly committed to its mission of contributing to the improvement of living spaces by focusing on the creativity, quality and durability of its architectural creations. 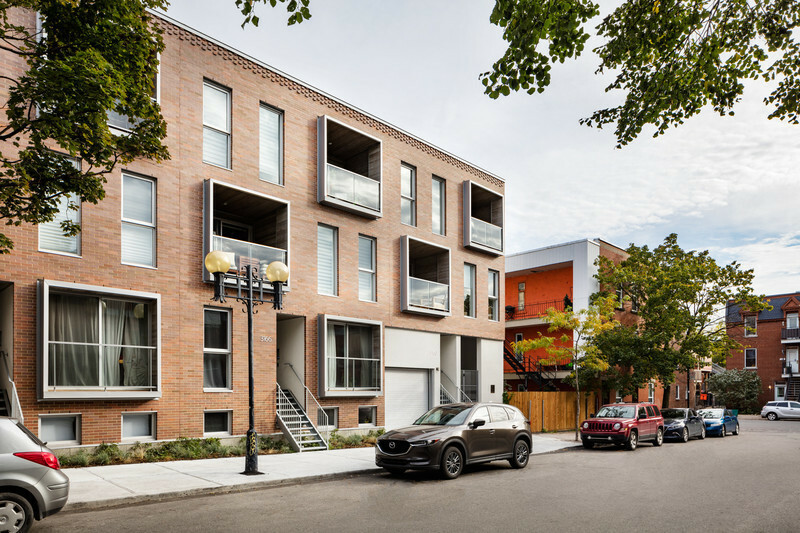 By offering well thought out, gimmick-free solutions in harmony with surrounding natural, cultural and urban landscapes, the firm seeks to contribute to the success of a distinct Québécois architecture that will be an integral part of tomorrow’s heritage. 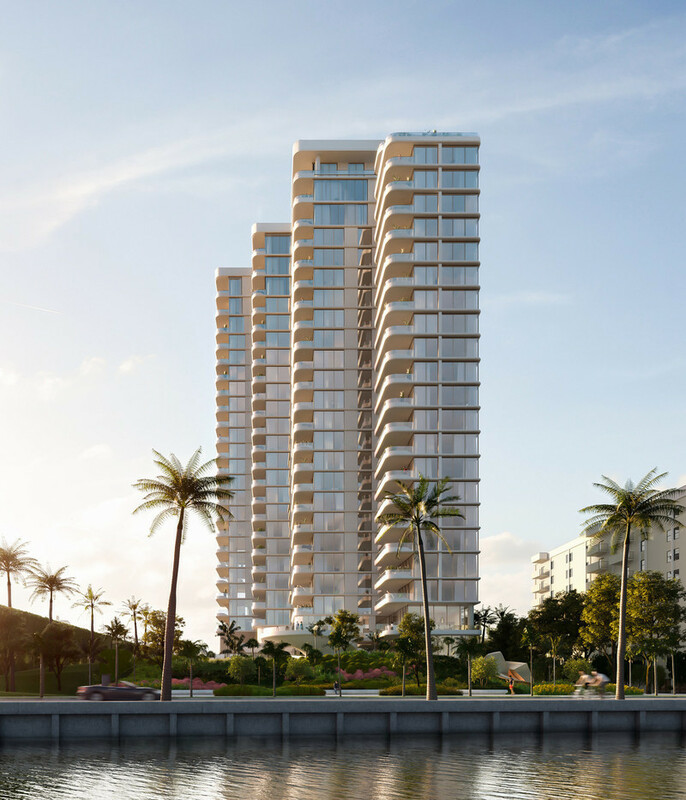 The firm’s conceptual, architectural, aesthetic and technical choices converge on the creation of spaces where “natural light and transparency” reign. 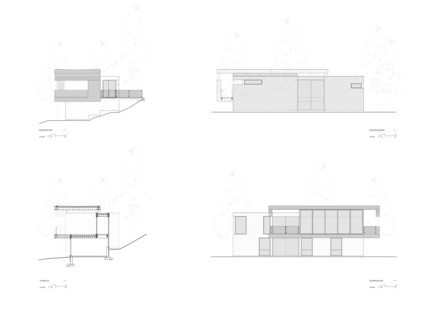 The approach is grounded in clear and elegant tectonic expression and fine detail work. Through its search for a perfect balance between complex components and elegant results, the team creates sensitive and stimulating spaces with emotional depth and historical resonance.